The good news is, the Subaru WRX STI looks way better than its lesser siblings in the 2008 Impreza lineup. That's mainly a function of the angular muscularity of the fender flares. The bad news is, those flamboyantly plasticular taillights likely won't look good on a darker colored car. The model again will provide homologation cover for the company's WRC rally car, though a model wearing the telltale midnight blue pearl was nowhere in attendence. Tokyo, October 24, 2007 - Fuji Heavy Industries Ltd. (FHI), the maker of Subaru automobiles, has announced the introduction of its all-new Subaru Impreza WRX STI in Japan. The new WRX STI went on sale nationwide through Subaru dealerships today. Advancing FHI's theme of producing the complete driver's car and embodying the essence of total driving control, the third-generation Impreza WRX STI has debuted with complete makeovers in its design, engine, chassis and features. Benefiting from Subaru's signature Symmetrical AWD and the Horizontally-Opposed Boxer engine, the new WRX STI is an innovative AWD sports model that delivers a combination of joy of driving and pride of ownership. The new five-door model features not only a greatly refined engine and suspension but new mechanisms such as the multi-mode Driver's Control Center Differential (DCCD) and multi-mode Vehicle Dynamics Control (VDC). Also, the Subaru Dynamic Chassis Control Concept (Subaru DC3) has been further developed for the WRX STI in order to maximize performance and driving pleasure and to ensure high levels of driver satisfaction through total control of the vehicle. The vehicle's interior and exterior design expresses sophistication and refined functionality. The widened body flares give an irresistible presence, integrating function and beauty, while the interior design stresses high quality and a sporty image. In addition, the Impreza WRX STI features advancements in the areas of environment, safety, and comfort, all of which match FHI's goal of delivering exceptional performance and enjoyable and dependable drivability with environmental considerations in all Subarus. The first-generation WRX STI model was based on the first Impreza WRX and was developed by Subaru Tecnica International (STI), an FHI subsidiary specialized in motorsports activities. Since its introduction in 1994, the WRX STI has established a solid reputation as a high-performance sports model. In the FIA World Rally Championship (WRC) that requires participants to compete with production-based models, Subaru WRX STI models have proven their credentials by bringing Subaru three consecutive Manufacturers' championship titles from 1995 to 1997. In this context, FHI plans to submit a Group N homologation application effective as of January 1, 2008 for the new WRX STI to FIA. 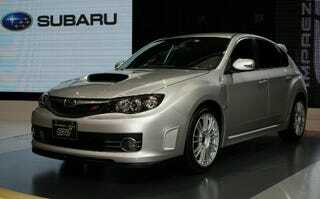 The introduction of the new WRX STI has completed the full lineup of the Impreza series in Japan. The Impreza 15S, 20S and S-GT models have been available since June 2007, each offering individual strengths in performance and comfort. Styled around the concept of "Pure Form for Driving", the widened body flares accentuate the 5-door body taken from the new Impreza. A deep-set character line, running along the side from the front bumper to the rear end, and a pronounced edge shape reflects light and shadows and gives the car a different look depending on the time of day. While retaining a consistent flow from front to rear bumper, the front and back fenders are prominently projected, creating a distinctive identity and gives the WRX a unique road presence. Aerodynamically improved body styling with a large rear spoiler optimizes the balance between the front and the rear quarter panels by reducing wind resistance. An aerodynamically curved form from the front bumper to the front fenders helps minimize lift forces and contributes to maintaining vehicle stability at high speeds. Engine compartment ventilation is provided on both sides of the front bumper and along the rear edges of the fenders. The strong front grille employs a sharp wing shape with metallic mesh, suggesting the car's inherent sportiness. The rear garnish is painted in the body color, enhancing the widened body shape. The rear edges of the front fenders are embellished with STI logo plated in cherry red. The muffler comes with twin dual-tail pipes. Eye-catching 18-inch aluminum-cast wheels, distinguished by their five spokes and highlighted by dark-tone high-luster paint, are standard. These wheels enhance the vehicle's bold and commanding presence while expressing high quality and streamlined beauty. BBS-brand cast wheels with spokes and sharp lines are also available as an option. Seven exterior colors are available: Obsidian black pearl; pure white; spark sliver metallic; dark gray metallic; lightning red; midnight blue pearl (only for the WRX STI); WR blue mica. The interior is finished in black and silver to highlight its streamlined design, as well as to create an impression of elegance and sportiness. Dynamic designs with decorative insets in the center panels and door trim express roominess in the cabin. The vehicle information display, which constantly shows outside temperature, average mileage and time, as well as a navigation screen and audio display, are placed nearer the top of the dashboard for improved visibility and functionality. The front bucket seats use a combination of Alcantara fabric and leather and are designed to offer easy access into and out of the vehicle and to hold the driver and passenger in comfortably and securely. Jointly developed by RECARO, custom bucket seats are also available as a manufacturer's option. The RECARO seats offer fuller side support and excel in maintaining a comfortable position for sporty driving. Their height adjustment enables the further lowering of the hip point setting in the seats. Power tilt and telescopic steering comes with a three-spoke genuine leather wheel embossed with the STI logo in its center. The instrument panel combines three meters, a tachometer between a speedometer and fuel gauge, in a single module illuminated in red. Each meter's dial is colored cherry red, the STI brand color, emphasizing a quality feel and sportiness. When the ignition key is turned on, the needles of the three meters swing up to their maximums and quickly fall back to their original positions, imparting a boost of excitement for the driver. The meter module also comes with a REV Indicator, DCCD Torque Indicator, and Shift-up Indicator. In addition, red LED lights are used for interior door step lights, and they are also provided for the console tray. The center console is embellished with the STI logo, which illuminates when the car's headlights are on.